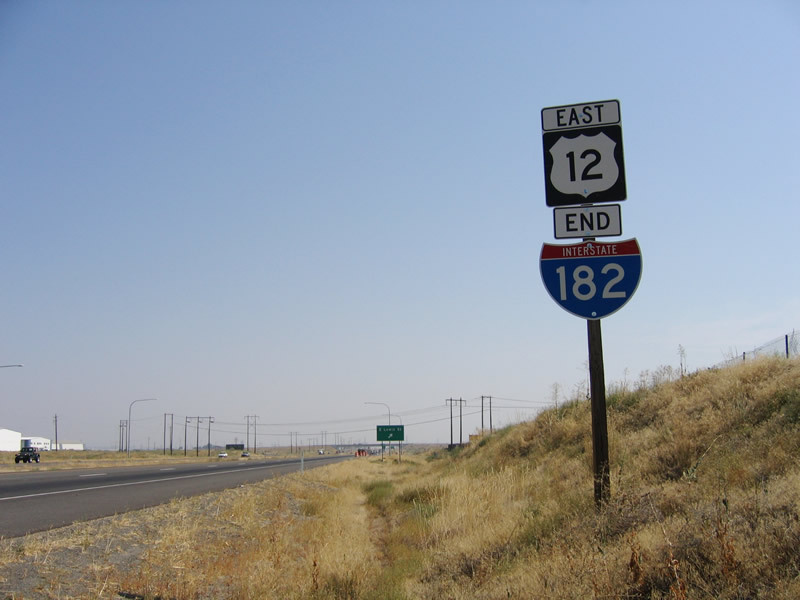 Interstate 182 connects the Tri-Cities in southern Washington with Interstate 82 west to Yakima and south across the Columbia River into Oregon. 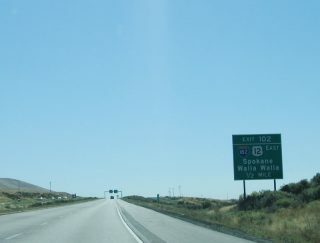 Carrying U.S. 12 throughout its length, the freeway provides part of the route east to Walla Walla and a truck route to U.S. 395 northeast toward Spokane. 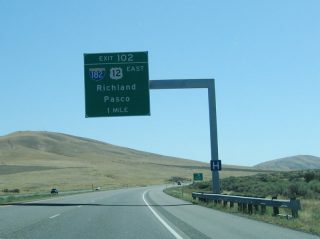 I-182 serves commuter traffic through Richland, West Pasco, Pasco. 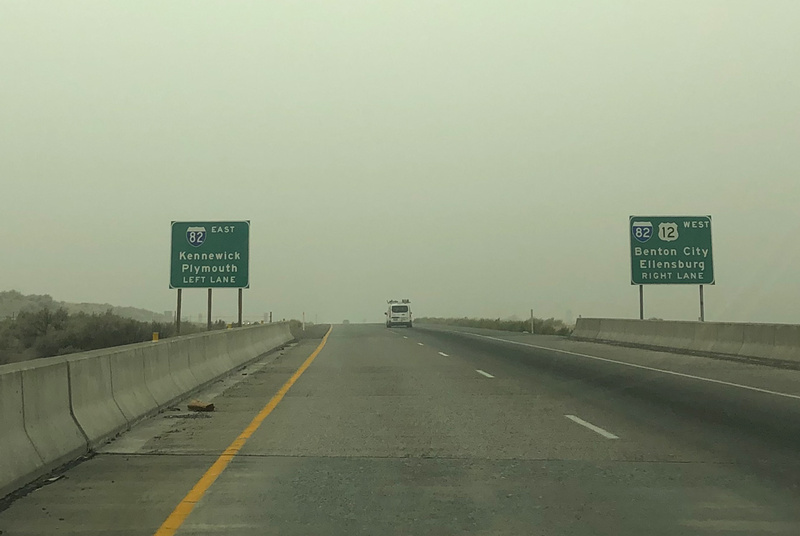 I-182 also briefly combines with SR 240, which heads north to the US Department of Energy’s Hanford site and southeast to the Columbia Center commercial areas in Kennewick. 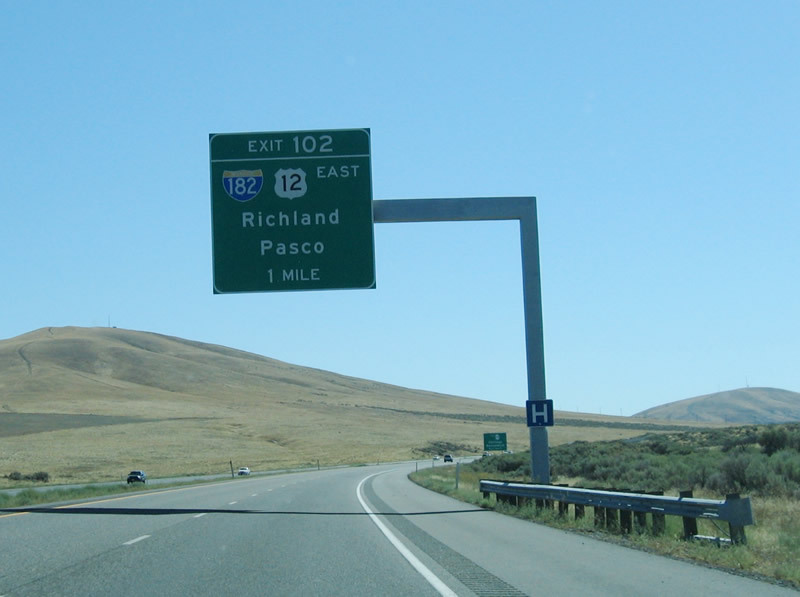 I-182 was designated by AASHTO between I-82 and Pasco on June 23, 1969. The freeway was completed in 1986. I-182 & U.S. 12 climbs through Goose Gap between Candy and Badger Mountains to the western terminus at Interstate 82. 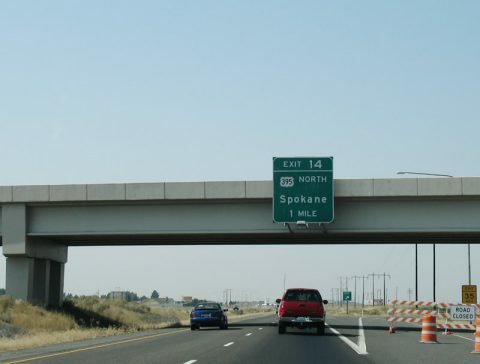 U.S. 12 joins I-82 west from the upcoming exchange to Yakima. Photo taken 08/28/06. 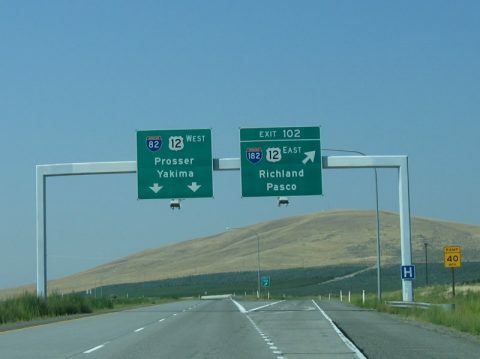 Leaving the Richland city limits, travelers on I-182 & U.S. 12 span Dallas Road just ahead of the ramp separation for I-82 south to Umatilla, Oregon and I-82 & U.S. 12 west to Prosser and Sunnyside. Photo taken 08/28/06. Interstate 182 concludes at a trumpet interchange by agricultural areas southwest of West Richland and Candy Mountain. 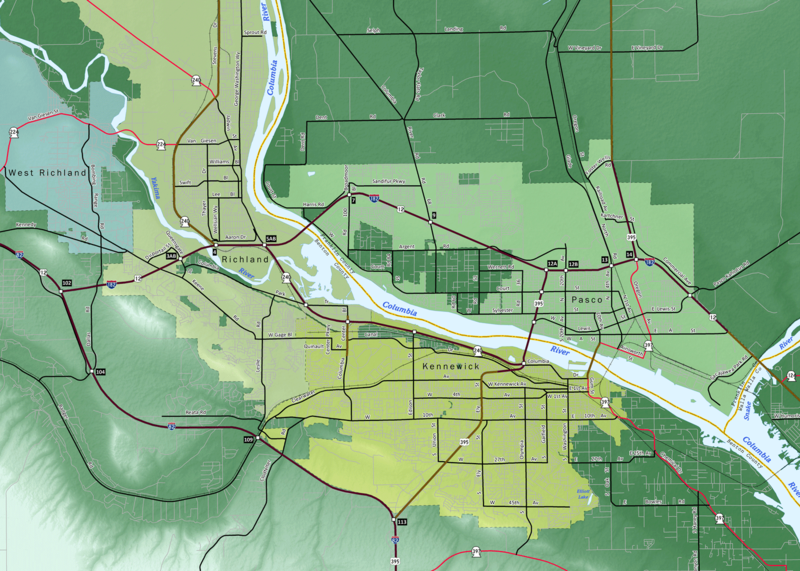 I-82 generally bypasses the Tri-Cities, though suburban areas spread southward to the freeway at Badger Road. Photo taken 08/28/06. Interstate 82 arcs northwest from suburban areas south of Richmond to meet Interstate 182 and U.S. 12 west of Badger Mountain in one mile. Photo taken 08/28/06. Exit 102 departs I-82 west for Interstate 182 & U.S. 12 east to Richland and Pasco of the Tri-Cities. Connections with U.S. 395 north lead travelers to I-90 at Ritzville and Spokane. Photo taken 08/28/06. 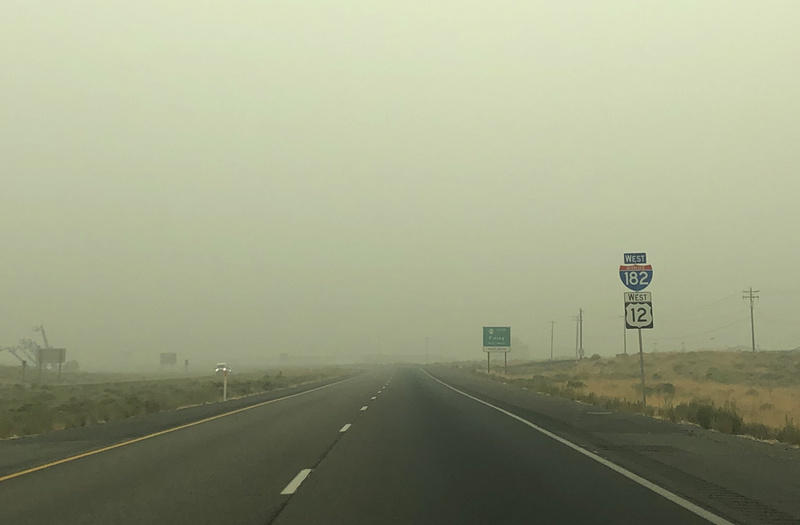 Interstate 82 & U.S. 12 make a gradual southward turn ahead of Candy Mountain and the Tri-Cities area to their split at Interstate 182. Photo taken 08/28/06. 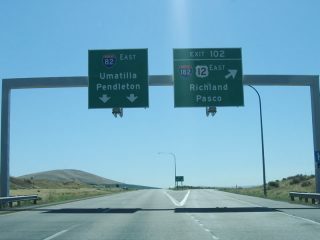 U.S. 12 combines with Interstate 182 east through Richland and Pasco before shifting onto its own alignment en route to Walla Walla and Lewiston. Photo taken 08/28/06. 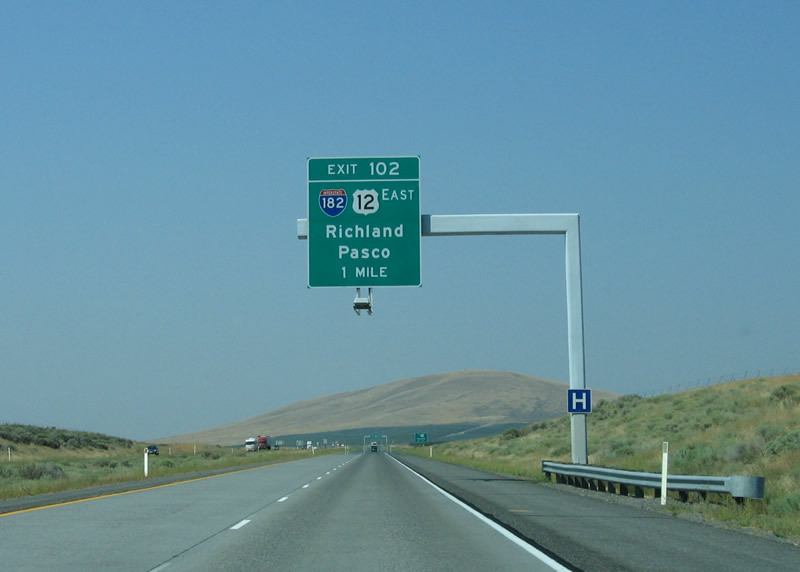 Eastbound Interstate 82 at Exit 102 for I-182 & U.S. 12 to Richland. 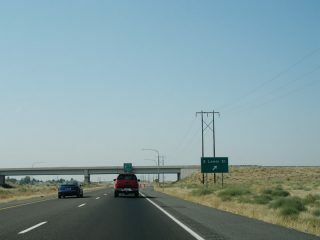 The Tri-Cities freeway spur represents one of three bridges across the Columbia River. 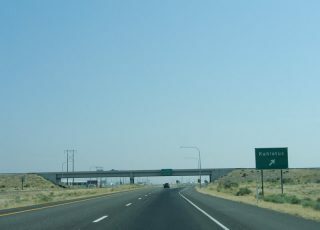 Running along the north side of West Pasco, I-182 connects with U.S. 395 south to Kennewick by Tri-Cities Airport (PSC). Photo taken 08/28/06. 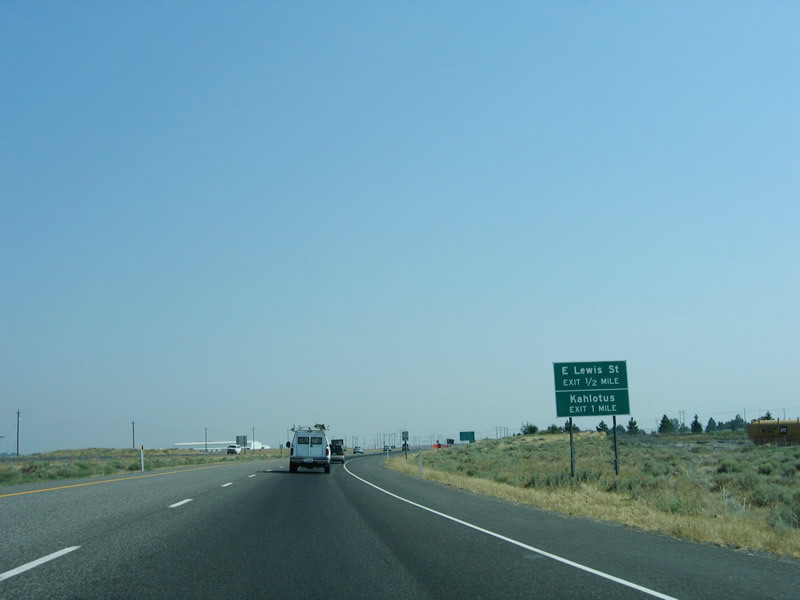 Interstate 182 extends a half mile southeast from the cloverleaf interchange with U.S. 395 north and SR 397 south to conclude just ahead of Lewis Street. Photo taken 08/28/06. 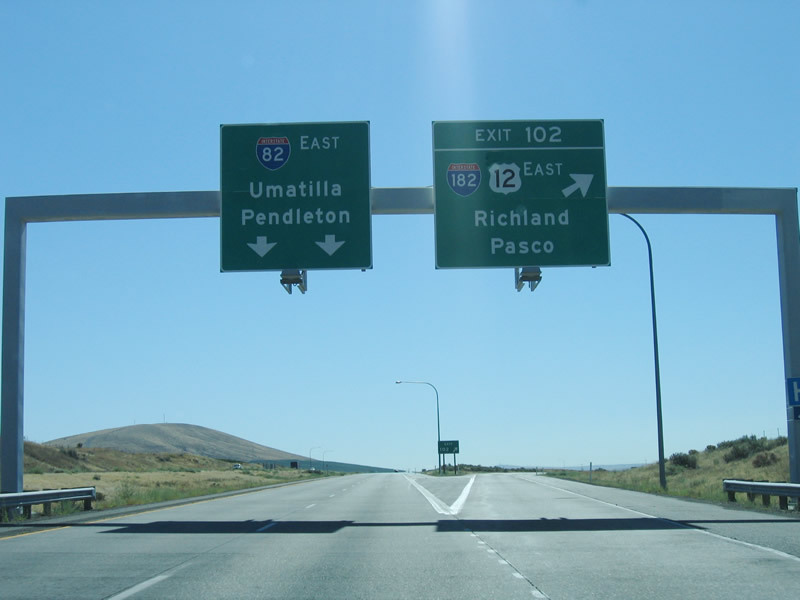 An end shield stands just ahead of the parclo interchange joining U.S. 12 with Lewis Street in Pasco. U.S. 12 continues southeast from here to the Vaughn Hubbard Bridge across the Snake River to Burbank. Photo taken 08/28/06. Lewis Street connects Interstate 182 and U.S. 12 with residential areas of east Pasco. Photo taken 08/28/06. U.S. 12 upgrades to a limited access highway beyond the intersection with East A Street. The ensuing interchange joins the route with Lewis Street south and Pasco Kahlotus Road. Photo taken 08/28/06. Entering the six-ramp parclo interchange with Lewis Street on U.S. 12 westbound. Interstate 182 begins just beyond this exchange. Photo taken 08/28/06. Lewis Street curves southwest from Pasco Kahlotus Road to Heritage Boulevard, where it turns west en route to the Pasco city center. 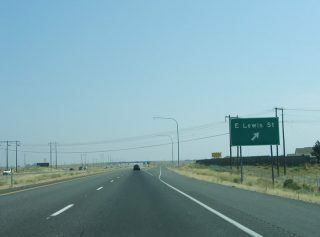 Lewis Street and Lewis Place west from the U.S. 12 freeway is the historic alignment of U.S. 395 and U.S. 410. Photo taken 08/28/06. 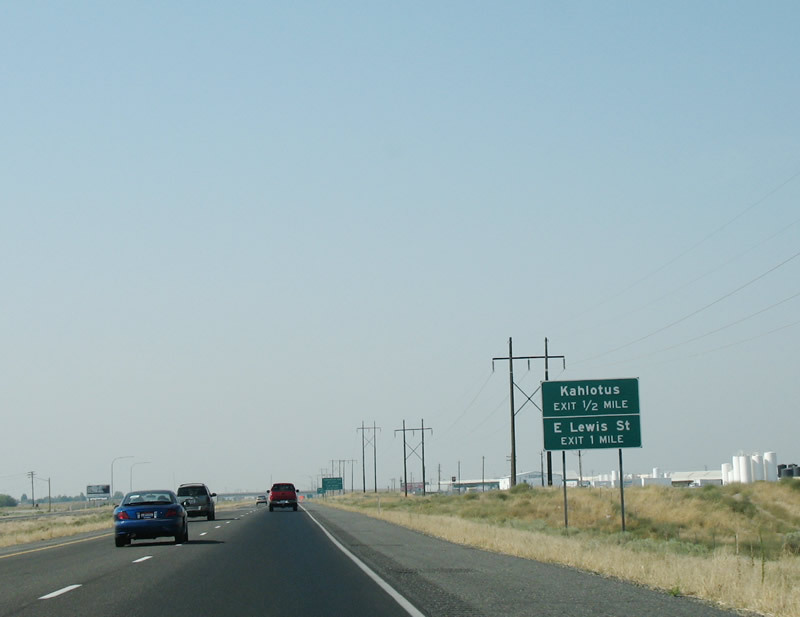 U.S. 12 advances westbound one mile to combine with U.S. 395 at Exit 14. U.S. 395 is an expressway corridor joining the Tri-Cities with Interstate 90 east to Spokane. Photo taken 08/28/06. 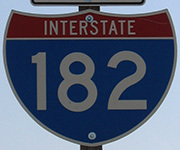 Interstate 182 begins along U.S. 12 west just beyond the entrance ramp from Lewis Street. 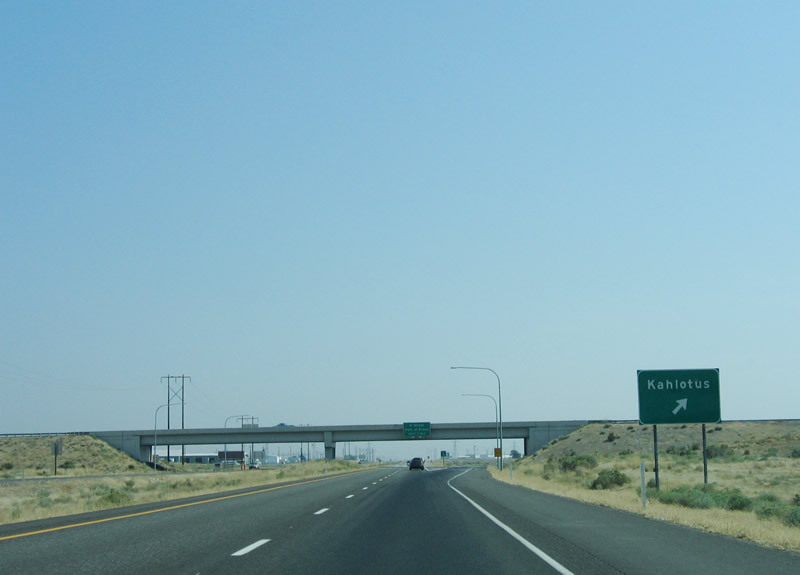 A collector roadway system separates from the freeway next for U.S. 395 north to Ritzville and SR 397 (Oregon Avenue) south into Pasco. Photo taken 08/28/06. “Richland roundabouts expected to alleviate Queensgate jams.” Tri-Cities Area Journal of Business (WA), February 2018.